Once the visual inspection of the existing HVAC system has been completed, performance measurements will have to be taken. The movement of air in the conditioned space has an impact on both system performance and the perceived comfort of occupants. Take measurements in the supply and return ductwork, and at supply and return diffusers. Measurements will confirm if air is being properly distributed throughout the entire system. One of the functions of the system is to supply adequate outdoor air to all spaces in the facility. Supply air is typically a mix of recirculated air and outdoor air. Mixing the two helps to reduce airborne contaminants and keep levels of carbon dioxide acceptable. How much is required depends on the number of people in the space and the level and type of activities taking place. Too little outdoor air and contaminant levels generally rise. Too much and energy costs increase. Two measurements will help determine if adequate air volume and outdoor air are being delivered. Capture hoods placed over room diffusers will quantify the volume of air being delivered to the space. Carbon dioxide loggers placed in rooms can track the buildup of the gas, a good indicator of how much outdoor air is being introduced. Loggers will have to be left in place for a period of time, particularly if occupancy and activity patterns change. A somewhat subjective performance measurement that is important to the evaluation of the system is the thermal comfort level of the occupants. The feedback from occupants can identify thermal comfort issues. While the perception of thermal comfort varies by individual and by the activities being performed by that individual, it is influenced by several factors related to the HVAC system, including temperature, relative humidity, and air movement. A mismatch of those factors to needs can have a significant impact on productivity. The assessment must include temperature and humidity measurements in all occupied spaces. Compare those measurements to the system’s control setpoints. Deviations can be the result of improper calibration, poorly located thermostats, or inadequate air flow. 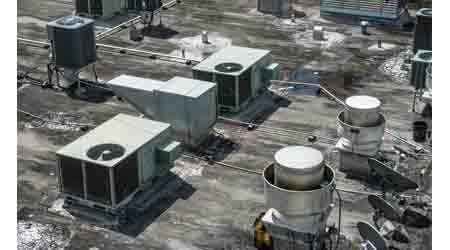 A common problem area in HVAC systems is the filtration system. Filters may not have been changed frequently enough, resulting in excessive pressure drop across the filters that can damage filter frames and ductwork. Filters may have been improperly installed, allowing air to flow around them, carrying contaminants into the supply ductwork. The wrong type of filters may have been installed or they may even have been removed in an attempt to increase air flow in the system. Closely inspect the entire filter section of the system for damage or signs that dirt has accumulated downstream. If the condition has existed for an extended period of time, it might be necessary to clean the ductwork throughout the facility. For each of the defects identified in the assessment, it is important to quantify the costs of repair and the associated additional energy costs if the problem isn’t addressed. If replacing the system is an option, a cost-benefit analysis should be completed that compares the options of repairing/upgrading the existing system with replacement. But if issues have been identified in the existing system that simple replacement will not solve, the cost of repairing those issues must be included in the replacement system cost for a realistic comparison. HVAC system assessments are time-consuming activities that must be planned well in advance of any system-upgrade program. But without them, facility managers will have no assurances that their upgrade program will actually achieve what they want.